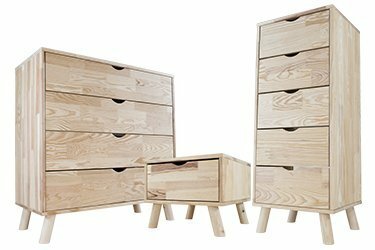 The trend of the moment our range Viking, Scandinavian-inspired furniture Made in France! Furnish your interior with wooden furniture for Room and Living Room, in keeping with the times: ethical and aesthetic. The sleek design and the captivating lines of our Scandinavian range will perfectly match your interior. Nothing like a cocooning and soothing atmosphere that pretty light wood furniture, entirely solid pine. The Viking range is also customizable. Choose from our color combinations or create your own for perfect harmony. 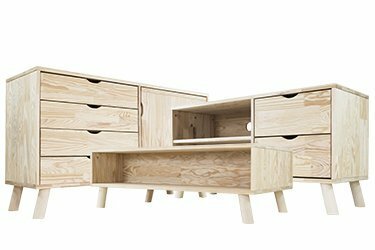 A complete range for bedroom (Scandinavian bed, dresser, chiffonier and bedside) and for living room (Viking sideboard, TV stand, coffee table) to discover now! Manufactured in France in our workshop, our Viking Bedroom are available in several colors. Water-based varnish. Bed Scandinavian, Chest of drawers Scandinavian, Tall Chest of 5 drawers Scandinavian, bedside table Scandinavian. Discover our range of Viking Living Room Scandinavian in Solid Wood Made in France. Manufactured in France in our workshop, our Viking Living Room are available in several colors. Water-based varnish. Buffet Scandinavian, TV cabinet Scandinavian, Coffee Table Scandinavian.